The Japanese Lunar Orbiter SELENE transmits several signals. One of the least difficult to receive is a beacon around 2263.602 MHz, which has a power of about 250mW driving a circularly polarized antenna. Therefore a sensitive receiving system is necessary, even more so if the receiving antenna is not circularly polarized. See the antenna there: www.ko4bb.com/ham_radio/2.4GHz_Stuff/. In any case, a low noise amplifier is most likely required before the mixer to get the signal out of the noise. I had a general purpose driver amplifier specified to operate from 1 to 2 GHz with 25 dB of gain. The amplifier gain actually is almost flat up to 3 GHz, but its noise performance is not known (it is not specified as an LNA). This page shows my attempt at measuring the noise figure of the device. For some background information on Noise Figure measurements, check the Maxim App Note 2875 (Ref 1) for a quick introduction, or if you want a thorough treatment, HP's App Note 57-1 on Noise Figure (Ref 2) or if you have more time (! ), the Mohr presentation (Ref 3). I initially tried to measure the noise directly at the output of the LNA with a Tek 494P spectrum analyzer, but the 494P is not quite sensitive enough to acurately measure the noise (or the LNA does not have enough gain), so I opted to measure the entire downconverter (LNA and mixer) because once the amplifier noise is converted down to below 32 MHz, I can use the very sensitive and calibrated HP 3586A Selective Voltmeter to measure noise. It's acuracy and resolution are a lot better too, and the digital display (with 0.01 dB resolution) makes it easy to use, compared to the CRT screen of the spectrum analyzer. LNA is a Miteq AMP-1161-16629 25dB, 1-2 GHz driver amplifier (not specified as an LNA). IF output of the mixer drives an HP 3586A tuned to 20 MHz, with Average ON. Turn LNA ON -> NP = -113.2 dBm. Noise power increases by 8 dB, so we can consider that the noise from the LNA dominates other sources of noise. So when the noise source is on, the noise power at the input increases by 8 dB (174 - 166), and the measured noise power increase at the output is ~5 dB (113.2 - 108.5), so the noise figure must be about 3 dB. Both plots were made with the Narrow Video Filter selected. Most very low noise amplifiers do not have their lowest noise figure when their input is perfectly matched to 50 ohms, or at their point of maximum gain. So it's not unusual for a good LNA to have an input VSWR somewhat different from 1.0:1. Since the attenuation due to component losses of a matching network could actually cause more loss than would be gained by a better match, you simply have to live with it. Also, the gain of the LNA is strongly affected by the impedance presented at it's input. The calculations performed above assume that the gain of the LNA is constant when the noise source is turned ON and OFF. That's a big assumption, because if the gain changes by X dB, that will affect the noise power output by the same number, and that will affect the calculated NF by the same X dB. This has caused some people to obtain negative noise figure at the end of the calculation. This occurs when the gain of the LNA increases so much when the noise source is off that the noise power output of the LNA is actually greater when the noise source is off. Therefore it is essential to make sure that the impedance that drives the LNA is constant when the noise source is on or off. 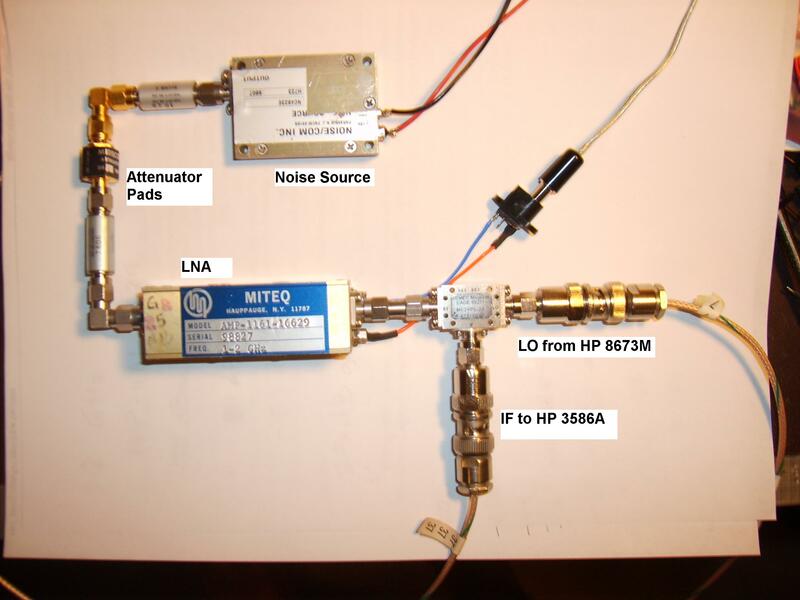 This is usually obtained by placing sufficient attenuation between the noise source and the LNA. Of course, that only works if the resulting noise is above that necessary to be above the LNA's intrinsic noise. Secondly, it is of course very important to know exactly the amount of noise power injected into the LNA, as the result of the calculation directly depends on it. This will depend on the calibration of the noise source itself, and the attenuation of the attenuator. Both components should be carefuly calibrated before the measurement. If your setup is not well calibrated, it may still be useful to compare different devices, or to optimize a particular LNA, but you won't know what the actual, absolute noise figure is.